Chris Gray and his Streetscapes column were back in Brooklyn this week, profiling one of the great architects of the Gilded Age. 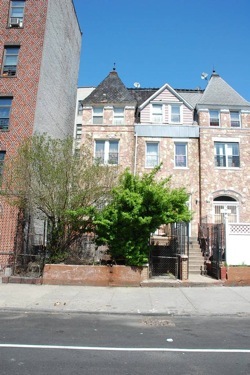 Much of Gilbert’s early work was done in the Park Slope area, but his first Brooklyn commission may have been this pair of buildings on Willoughby Avenue in Bed-Stuy. Despite the permastone, there are some traces of old stuff, particularly the profile of the roof and the cresting atop it. And the massing of the buildings looks quite consistent with Gilbert’s other work of the period.